Perfection of Wisdom Sutra in Eighteen Thousand Lines (Skt. Aṣṭādaśasāhasrikā Prajñāpāramitā; Tib. ཤེས་རབ་ཀྱི་ཕ་རོལ་ཏུ་ཕྱིན་པ་ཁྲི་བརྒྱད་སྟོང་པ་, sherab kyi parol tu chinpa tri gye tongpa, Wyl. 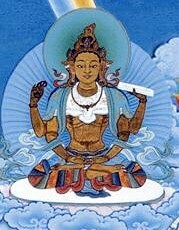 shes rab kyi pha rol tu phyin pa khri brgyad stong pa) is counted among the so-called six mother scriptures, the most important prajnaparamita sutras. This page was last edited on 25 March 2018, at 02:14.